PARSONS, Kan. — An unlikely pilgrimage is under way to Dwayne’s Photo, a small family business that has through luck and persistence become the last processor in the world of Kodachrome, the first successful color film and still the most beloved. 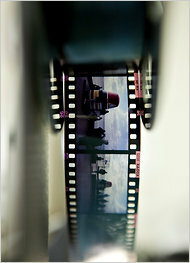 Kodak stopped making Kodachrome film in 2009. Kodachrome rewarded generations of skilled users with a richness of color and a unique treatment of light. Dwayne’s Photo, in Parsons, Kan., will be processing the final rolls of it Thursday. That celebrated 75-year run from mainstream to niche photography is scheduled to come to an end on Thursday when the last processing machine is shut down here to be sold for scrap. In the last weeks, dozens of visitors and thousands of overnight packages have raced here, transforming this small prairie-bound city not far from the Oklahoma border for a brief time into a center of nostalgia for the days when photographs appeared not in the sterile frame of a computer screen or in a pack of flimsy prints from the local drugstore but in the warm glow of a projector pulling an image from a carousel of vivid slides. In the span of minutes this week, two such visitors arrived. The first was a railroad worker who had driven from Arkansas to pick up 1,580 rolls of film that he had just paid $15,798 to develop. The second was an artist who had driven directly here after flying from London to Wichita, Kan., on her first trip to the United States to turn in three rolls of film and shoot five more before the processing deadline. The artist, Aliceson Carter, 42, was incredulous as she watched the railroad worker, Jim DeNike, 53, loading a dozen boxes that contained nearly 50,000 slides into his old maroon Pontiac. He explained that every picture inside was of railroad trains and that he had borrowed money from his father’s retirement account to pay for developing them. “That’s crazy to me,” Ms. Carter said. Then she snapped a picture of Mr. DeNike on one of her last rolls. As news media around the world have heralded Thursday’s end of an era, rolls of the discontinued film that had been hoarded in freezers and tucked away in closets, sometimes for decades, have flooded Dwayne’s Photo, arriving from six continents. Among the recent visitors was Steve McCurry, a photographer whose work has appeared for decades in National Geographic including his well-known cover portrait, shot in Kodachrome, of a Afghan girl that highlights what he describes as the “sublime quality” of the film. When Kodak stopped producing the film last year, the company gave him the last roll, which he hand-delivered to Parsons. “I wasn’t going to take any chances,” he explained. At the peak, there were about 25 labs worldwide that processed Kodachrome, but the last Kodak-run facility in the United States closed several years ago, then the one in Japan and then the one in Switzerland. Since then, all that was left has been Dwayne’s Photo. Last year, Kodak stopped producing the chemicals needed to develop the film, providing the business with enough to continue processing through the end of 2010. And last week, right on schedule, the lab opened up the last canister of blue dye. Kodak declined to comment for this article. The status of lone survivor is a point of pride for Dwayne Steinle, who remembers being warned more than once by a Kodak representative after he opened the business more than a half-century ago that the area was too sparsely populated for the studio to succeed. It has survived in part because Mr. Steinle and his son Grant focused on lower-volume specialties — like black-and-white and print-to-print developing, and, in the early ’90s, the processing of Kodachrome. Still, the toll of the widespread switch to digital photography has been painful for Dwayne’s, much as it has for Kodak. In the last decade, the number of employees has been cut to about 60 from 200 and digital sales now account for nearly half of revenue. Most of the staff and even the owners acknowledge that they primarily use digital cameras. “That’s what we see as the future of the business,” said Grant Steinle, who runs the business now. The passing of Kodachrome has been much noted, from the CBS News program ”Sunday Morning” to The Irish Times, but it is noteworthy in no small part for how long it survived. Created in 1935, Kodachrome was an instant hit as the first film to effectively render color. This week, the employees at Dwayne’s worked at a frenetic pace, keeping a processing machine that has typically operated just a few hours a day working around the clock (one of the many notes on the lab wall reads: “I took this to a drugstore and they didn’t even know what it was”). “We really didn’t expect it to be this crazy,” said Lanie George, who manages the Kodachrome processing department. 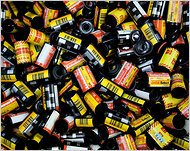 One of the toughest decisions was how to deal with the dozens of requests from amateurs and professionals alike to provide the last roll to be processed.